Today, you’ll learn more about Asian Americans and the presidential campaign from the just released 2016 National Asian American Survey than you will from that Veep debate last night. 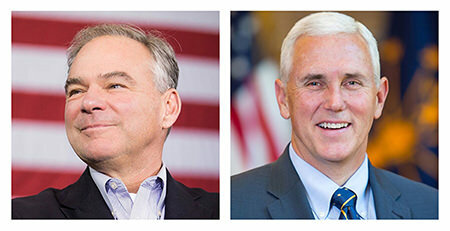 Did you watch the Veep Debate–where the TV show “Veep” is better known than either Tim Kaine or Mike Pence? It’s a little like watching replacement players during an NFL strike. Only an electorate with a death wish would care about a Veep debate. I mean, someone has to be incapacitated or die for these guys to really matter. Considering the presidential race is between the two most unliked candidates in history, that might be relevant. Who are we stuck with if someone forgets to take his or her medicine? But in many ways, last night’s Veep debate mirrored the Asian American community’s political plight. Here were two semi-anonymous proxies, Pence and Kaine, white men in waiting, in a debate moderated by Elaine Quijano. She’s a great CBS reporter who is hidden on the weekends and in the app world of CBSN–an Asian American of Filipino descent, who I’m sure most watchers thought by her surname was Latina. And that’s the problem most of us Asian Americans have. No one knows or cares to know all that much about Asian Americans politically. But now, we’ve got data! If most Americans before last night were saying, “Pence who? Kaine what?” we can say this morning that Asian American voters really matter, having grown by more than 1.2 million eligible voters in each election cycle since 2000. We’re also tilting faster toward the Democratic Party overall. Add it all up and on election day, AAPIs are projected to support Hillary Clinton over Donald Trump by 70 percent to 20 percent, with 10 percent for others. But that doesn’t mean we can be ignored in the late stages of campaign 2016. The projection takes into account something most other polls wouldn’t pick up. Asian Americans aren’t all Democrats (Blue) or Republican (Red). We’re kind of a unique blend of Asian American purple. While 41 percent identify as Democrat as compared to 16 percent Republican, a very large number of Asian American voters choose neither party. Forty-one percent don’t identify as either Democrat or Republican. And 30 percent say they are outright independents. Anyone want a modern definition of swing voters? On a political Tinder app, we’ll swipe wherever we damn well please. All of this comes from the just released 2016 National Asian American Survey, the quadrennial nationwide phone poll that finally takes Asian Americans seriously enough to call up and find out what we actually think. By we, I mean Asian Indian, Chinese, Filipinos, Koreans, Japanese, and Vietnamese. And for the first time, the survey includes national samples of Hmong, Cambodians, and Native Hawaiian/Pacific Islanders. It was done in English and ten Asian languages over landlines and mobile phones. And all it took was 2,238 AAPIs to be randomly contacted nationwide. It’s not an easy task, which is why most other national polls choose to ignore Asian Americans, period. If you’ve ever wondered why a poll only mentions Blacks or Latinos, that’s your reason. They’re not looking for us. Most pollsters simply decide to make us invisible. To the vast majority of pollsters, we’re not worth the time and money. I’ve spoken out on this for years because as the polls go, so go the pols. When we don’t show up in the polls, pols don’t come courting or bother to acknowledge we’re there. We’ve seen one key NAAS 2016 finding before: “There is a pressing need for Asian American voter outreach, especially given the reported lack of contact by parties and candidates,” according to the 2016 survey. Because of the work of Karthick Ramakrishnan, a political scientist at UC Riverside, as well as colleagues Jennifer Lee of UC Irvine, Taeku Lee of UC Berkeley, and Janelle Wong of Univ. of Maryland, the data is available. There is no excuse to ignore Asian Americans. At least not for the next 30 days. I always find the ethnicity/national origin details to be revealing in the NAAS, and this year seems to show a trend. Among the large AAPI groups, Asian Indians are far more loyal Democratic by a 53 percent to 7 percent margin. Overall, Hmongs are the most Democratic, at 60 percent to 4 percent Republicans. But it’s the Vietnamese Americans who are the most divided, with Democrats leading Republicans 29 percent to 23 percent. This actually shows a drop from previous surveys, where Vietnamese Republicans were as much as 42 percent in 2008. It seems more are choosing to call themselves “Independent,” 47 percent. Filipino Americans are the group that continue a rightward lean. In 2008 to 2016, the group has grown from 18 percent Republican to 25 percent. Filipino Democrats are still at 41 percent. But once again, there’s 31 percent who say they are non-partisan. Of all AAPI groups, Chinese Americans are the most willing to negotiate for their vote–61 percent claim to be non-partisan. The survey takes into account so-called “leanings” of non-partisan and Independents. And here’s where the truth comes out in the wash.
Democrats hold a 2-1 average overall when the “leaning” numbers are tallied. For example, when Chinese Americans’ leanings are taken to account, 18 percent identify as Republican, and 30 percent pure Independent. The majority, though, peel off to make Democrats dominant at 51 percent. The stats are more fun than compiling and comparing National League pitching stats for WHIP. (Madison Bumgarner’s of the Giants, by the way, is at 1.05; the Mets’ Noah Syndergaard’s is at 1.15). But now, NAAS tells us: Asian Americans have an overall 3-1 preference for Clinton over Trump. We consider jobs and the economy, healthcare, and education as the most important issues in the U.S. today. And the majority of us are aligned with African Americans to ensure racial equality. More importantly, the independent streaks show that there are differences amongst us huddled under our big umbrella that you may call AAPI or AANHPI. Indeed, the umbrella should only make everyone see we are not easily stereotyped and are becoming a far more complex and diverse group than anyone realizes. As the fastest growing racia l group in the U.S., Asian Americans matter as a political presence–if anyone bothers to notice. And that means you, major networks and newspapers, and any other pollsters who dare to stick a finger in the air and generalize about an American electorate without us.